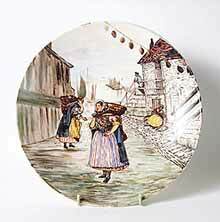 Decorated plate marked C.W.T. - 10" (254 mm) diameter. Women with baskets in fishiing village. Initialled C.W.T.